There will be portaloos outside Kinvara Community Centre where registration takes place from early in the morning on the day of the race. 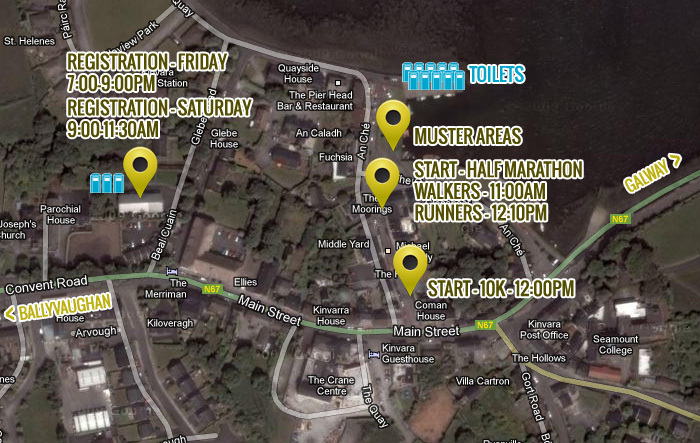 However, the main area for toilets will be on the quay near the start lines (see map below). There will be also one “emergency” toilet roughly half way along the half marathon route but there are no toilets on the 10K route. This toilet will be at miles 6 and 20 on the full marathon course. The toilets on the quay and outside the community centre will be available all day.